Andre Coimbra is a poker player who’s always had a strong connection with computers and games. With those interests, it’s no surprise that he’s one of the biggest online players in his home country of Portugal. Andre always enjoyed playing board games with friends and family, and represented his country three times in the International Olympiad in Informatics; a computer science competition for high school students. It’s no surprise that Andre went on to get a degree in Computer Science with a minor in Mathematics. Like many other modern poker pros, Andre started playing Magic: The Gathering before he ever discovered poker. In 2005, he played in his first Magic World Championship and took 8th place; an accomplishment that delivered $7,500 to the then 19 year old. That same year, Andre took an interest in poker and began playing Limit Hold’em and studying the game that would eventually become his full time profession. In 2007, he started playing multi-table tournaments on PokerStars under the name acoimbra, and it wasn’t long before he won an $11 rebuy tournament, which boosted his bankroll and his eagerness to pursue poker. 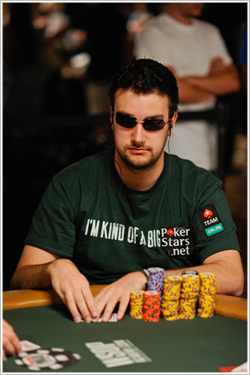 Soon, acoimbra was regularly multi-tabling Sit and Go’s on PokerStars and reached Supernova status at the end of 2008. 2009 was a huge year for the young Portuguese poker player. Andre Coimbra had started his year with a goal of reaching the most prestigious PokerStars VIP level: Supernova Elite, which is a highly prestigious title among online poker players, but no easy task to accomplish. While Andre was diligently working on accomplishing his ambitious goal, he somehow managed to find time to travel to the Magic World Championships and was crowned the first Portuguese winner of that event. After receiving $45,000 for his win, Andre returned to the poker grind and eventually accomplished his goal of reaching Supernova Elite and was invited to be a member of Team PokerStars Online. Andre Coimbra is now known for multi-tabling mid and high-stakes Sit and Go’s at PokerStars, where he plays up to 20 at a time. He’s also a regular feature on the Battle of the Planets Leader Board, and was the first Portuguese player to make Supernova Elite VIP status. In addition, Andre represents PokerStars in major live tournaments around the world and boasts cashes at both the World Series of Poker and the European Poker Tour. In his downtime away from poker he likes to hang out with friends and go to the movies. He sees representing Team PokerStars Online as a great honor, as well as confirmation that he’s got what it takes to play at the highest level. You can find him at the tables under the User ID ‘acoimbra’.